Need free SEO advice for your blog or current business? Don’t know where to look in today’s cluttered internet world? Well lucky for you I have found Daniel Lew who runs a blog at DanLew.com and gives his readers free advice on making money online and seo tactics. He was born in Australia and has been a seasoned seo professional and internet marketer making a full time living online. He boasts a large amount of self created and owned websites, each deserving great recognition in earning him a full time income to this date! 1. GSEO.net – A Search Engine Optimization services and community portal with a Global reach and over 500 SEO consultants. One of the most impressive things from this site is that it currently ranks number 1 for “Seo Services” in Google.com.au. 2. 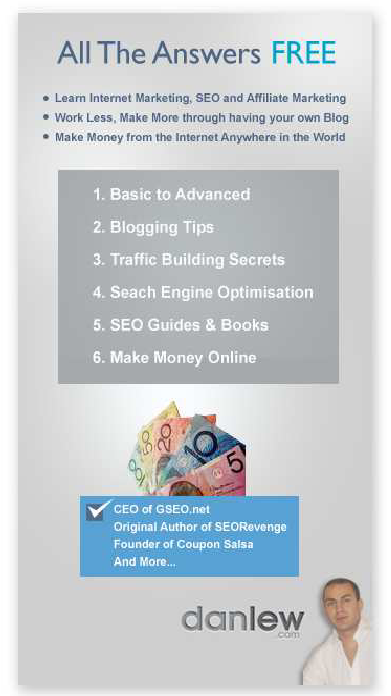 SEO Revenge eBook – Author and original creator behind SEO Revenge. This is mainly a introduction for beginners to intermediates in seo training and tips. 3. Coupon Salsa – A recently launched website which offers codes and discounts for any brand or retail store. Daniel has had many other projects in development, and I’m sure there will be more to come so stay tuned for their launch! Not only is he an avid creator of numerous websites, he also likes to travel around regularly in his spare time from Thailand and other parts of the world. He is always looking to expand his client database and network of marketing friends and bloggers, so make sure to visit his blog and connect with him! He is a strong entrepreneur at heart and never settles for anything but the best! He even owned Thailand’s number 1 business directory that got 1 million page views per month! I can tell you for certainty he knows his stuff! At age 32, he has currently been in the internet marketing world for over 17 years so take advantage of all of that experience and visit his blog right now! Visit Dan Lew’s Blog Right Now!